Empower Queer & Trans Youth! Make your gift to GSA Network today and support thousands of LGBTQ and ally youth leaders across the United States! Donors like you are critical to our work. Make your investment in GSA youth leaders through a special one-time gift or by joining the Booster Club, our monthly and quarterly giving program. 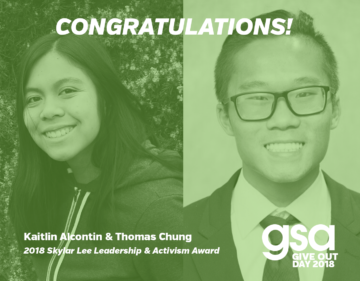 With your steady support, GSA Network youth leaders can continue to transform their schools and communities and fight for all students to have the opportunity to succeed. I am contributing on behalf of an organization or business. Honor someone you love with a gift in their name. GSA Network is a 501c3 nonprofit organization. Your generous gifts to GSA Network are tax-deductible. You will be emailed a receipt once your donation is received.